I’m happy to say I know Richard Cahan (and I work with his wife,) but if I didn’t I’d only recommend the book even more! Looking at the photos of buildings long-gone, especially those by Louis Sullivan, is like listening to a gorgeous recording of an opera singer no longer alive, such as Maria Callas. You can not understand how something so beautiful, so moving, something that inspires so much love in you, can be gone. But the buildings are gone, torn down. I dream that some day they’ll come back. I knew Louis Sullivan was good. I regret to say I’d never known how good Richard Nickel was. And I knew his photographs fairly well. 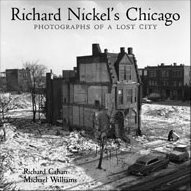 I have Rich Cahan’s previous book on Richard Nickel. But until I saw this book, I didn’t know how great Nickel was. Cahan and Michael Williams show you, in gorgeously printed blacks and whites, and every tone in between, how the city has changed. Architecturally, urbanistically, sociologically. You feel in your gut what we’ve lost. This book reminds you that great architecture creates space. And the loss of great architecture creates an empty space – in your stomach. And the wanton destruction of great architecture creates an empty space, in your soul. You can buy the book in the gift shop of the Chicago Architecture Foundation. I’m sure they’d mail you one too. If you’re looking for a gift, for a friend who appreciates true beauty, this is it. Or buy it straight from the press. You are currently browsing the archives for the Rich Cahan category.